"Great service, especially for the price. Will use again"
"Very good and friendly service." "Thanks for leaving a good review." "The coach was lovely and clean and very comfortable. The driver was helpful. The whole journey was great and I would definitely suggest it to others and would use it again,"
"Journey was excellent The driver was well presented and helpful The vehicle was clean and comfortable." 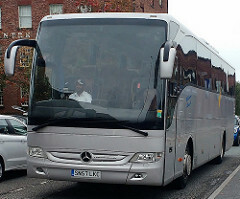 "The coach was immaculate and our driver was really lovely, and a great driver. They were there on time and everything went to plan! I was a little dubious about booking a service only seen online but needn’t have been, everything was spot on." "Abdi was a fantastic driver & host to that fact.. He made the journey very comfortable & put up with the poor choice in music from the Kitlocker team. Will be suggesting to use you guys again.. Thank you for the service"
"would definitely recommend them the driver was highly professional and the coach was clean and comfortable." "The journey was very relaxing and the driver was approachable with a positive attitude." "I have recently hired a coach, the coach was clean and in a good condition the toilets were clean and OMG the seats were very comfortable. would definitely recommend them as their price is also unbeatable, trust me I have done so much research before I hired the coach with them and it cost me way less than it would with other companies that I have used previously. And the driver was very pleasant and friendly." "It was terrible, we hired 2 coaches, they were both late on arrival on the date of departure. Both coaches were going to the same destination and both coaches Air Condtion was not working, It was a hot day and very hot inside which was totally unacceptable. All our passengers were very distressed and unhappy. We phoned the owner of the company and spoke to Usman, and he was aware that the aircon was not working, We argued with him that the least he could have done was to inform us and give us a discount of some sort. Toilets smelling, no water in toliets, etc. Very uncomfortable. On the way back it was even worse. One coach was diverted via Liverpool without informing us and then to London. It took 3-4 hours more than expected. The other coach which I was on, broke down, it took 3 hours for the mechanic to come and another 2-3 hours to get back home. During this time we continously was phoning Usman to get an update but we were not gievn much update other than we are trying to sort the problem out. Again, both coaches no Aircon on the way back either. We want to take this up with the coaches regulatory body as we would demand a full refund due to the very very poor service that we received on both coaches. Whilst we were stranded for 5 hours, we had to incur extra cost for refreshments for all the passengers, We would like to make a formal complaint to the regulatory body so that this is investigated and so that it doe not happen again. Hope you can help us with this matter. Thank you but we would not recommend anyone to travel with that particular coach company. We use coaches regularly and put our trust in you to arrange someone decent but it turned out to be a nightmare!! waiting for a postive response from yourselves. I have already logged a compliant with coach company and they have not even acknowledged my text. Very disappointed and bitter sorry to say. I was the organiser for my group and they have all been swearing at me and asking for a refund. Mr Shahbaz Hussain"